The health care law, the Affordable Care Act, expands health insurance with more benefits and greater access for more people and more affordable coverage for many. A key part of the law is to strengthen Medicare. 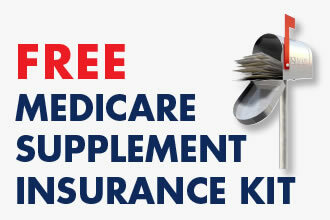 Under the new health care law, your guaranteed Medicare-covered benefits won’t be reduced or taken away. The new law does not change how you select your own doctor. You will continue to choose your doctors based on Medicare guidelines. If you are enrolled in a Medicare Advantage Plan or group health plan, different rules may apply. Check with your plan provider for details. The Medicare Part D prescription drug program is going through changes over the next few years. Most Medicare drug plans have a coverage gap (known as a “donut hole”). This means these is an initial limit on what the drug plan will cover for prescription drugs. If you reach the coverage gap in your Medicare Part D prescription drug coverage, this table shows you what you will pay through 2020. 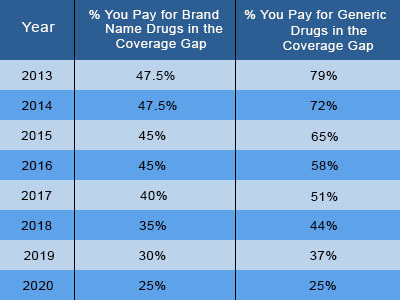 In the gap, you pay the cost of prescription drugs (at discounted rates) until you reach the coverage threshold ($4,750 in 2013). If you then qualify for “catastrophic coverage,” and you will only be responsible for 5% of your prescription costs for the year. By 2020, once your deductible is met, you will pay only 25% of your covered drug costs. The reduced cost continues until you reach the yearly out-of-pocket spending limit. The drug coverage gap “donut hole” will be fully closed by 2020.  You will be able to get a yearly wellness exam without any out-of-pocket expenses. Medicare now covers certain preventative services at 100%. There is no added out-of-pocket cost for preventative care such as flu shots, preventative mammograms, colonoscopies, osteoporosis screening and immunizations. Skilled nursing facilities will publish information about the owners and how they operate to help people compare places. High-need Medicare patients will have access to basic health care services in their homes. This will help prevent hospital stays and improve their satisfaction. The Medicare Part A (hospital insurance) tax rate on wages will be increasing for higher-income taxpayers (individuals earning more than $200,00 and couples earning more than $250,000) by 0.9% – from 1.45% to 2.35%, beginning in 2013. The law freezes the income thresholds for the Medicare Part B and Part D income-related premium at 2010 levels ($85,000 for an individual and $170 for a couple) through 2019. It also adds a new income-related premium for Part D.
Learn more and enroll in a health plan for 2014 here. Email updates from the Department of Health & Human Services. Sign up on the website here.